Or maybe it was because brown water came out of the faucet every time we turned the water on! For those reasons and many more, we are not big fans of this bathroom. 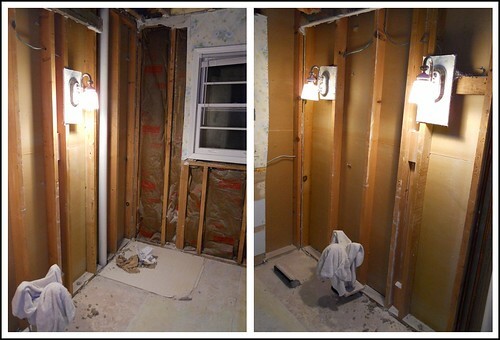 Our first order of business was to remove the bulk heads above the shower and the vanity. 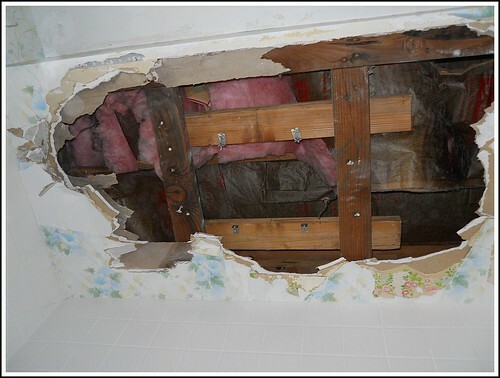 We were relieved to find that they weren’t covering up any plumbing or heat vents…and basically served no purpose! 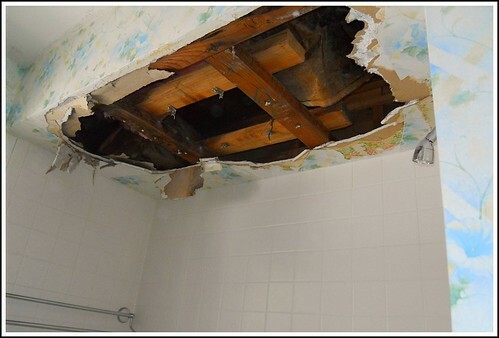 Then the entire ceiling had to go. Then we removed the vanity, linen cabinet, toilet, and walls. 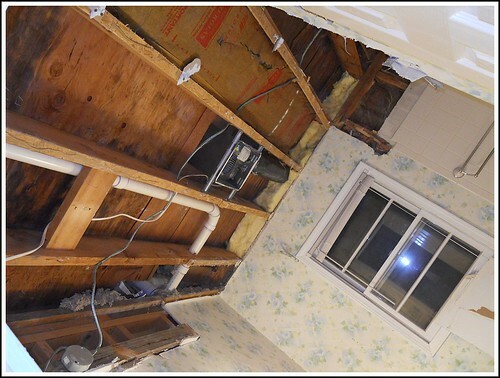 Now, the only thing left to do is remove the tub and tiles — which is MUCH easier said than done. And I suppose we should clean up the mess! Anyone want to take a bath? 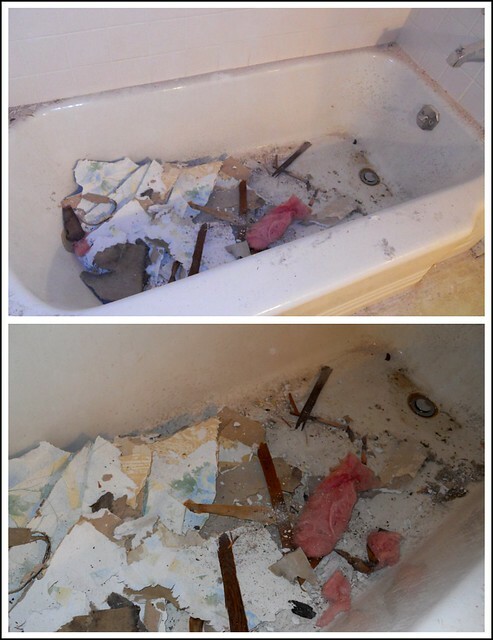 A HUGE thanks to my dad for doing the bulk of our bathroom demolition. Dave and I are super busy right now and are so thankful my dad was willing to help out. This vanity is from Pottery Barn, but I know someone who can custom build a cabinet to look JUST like this one for a fraction of the price! That precious yellow bathroom is rather smothery. Why Why Why do people use flowerdy wallpaper? And isn’t demolition fun? Yesterday I tore off the border in the bathroom. I put up with it since we moved 8 months ago, and it was Time to Go! My husband thought the bathroom looked cleaner, not realizing the change I’d made. Wow.. 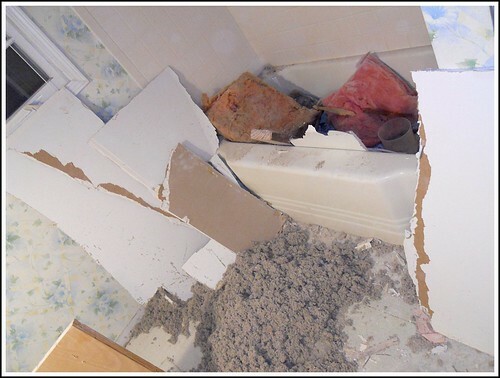 I did not think it was that bad to begin with.. at least everything matched.. my main bath when we moved in has a green sink, hot pink bathtub, and the toilet is 2 colors.. creme on the bottom and light purple on the top..
We have since replaced the tub.. It leaked like crazy..so that is now white.. I want to put in a double sink.. I have the faucets bought.. Now it is just paying for the rest of it? HA ! Nice demolition work. It will feel so nice when it’s done. I’ve got a bathroom right now that could use your handiwork, it’s even got a dark forest green sink and toilet. If you end up with a bathroom like the the final picture, I am going to be sooooo jealous. I can’t wait to see. We are in the throes of renovating our hall/guest bathroom. Let’s just say that a “can of worms” is a great description!